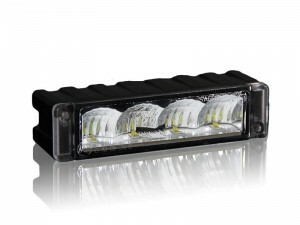 High-tech, emergency LED vehicle lights entered the market in 1995 with the advent of the unique LED and lens design. Since that time R&D teams have been perfecting not only the extremely bright, colored LEDs but have created 3 lenses that control light output on specific targeted areas: the TIR lens, the Linear lens, and the 180° Wide-Angle Lens. Add to these developments, the creation of a new substance from the petrochemical industry: polycarbonate. So when considering emergency lights, there’s more to think about than just the wattage and brightness of the LEDs; it is equally important to know how visible the lights are, how far and how wide the lenses shine, how well they are seen, and how durable and long lasting the materials are. Extreme Tactical Dynamics stands out in the Emergency Light Market because we know the importance of competitive pricing, high-quality products, and excellent optical qualities. Powerful emergency lights are only as good as their TOTAL PERFORMANCE. 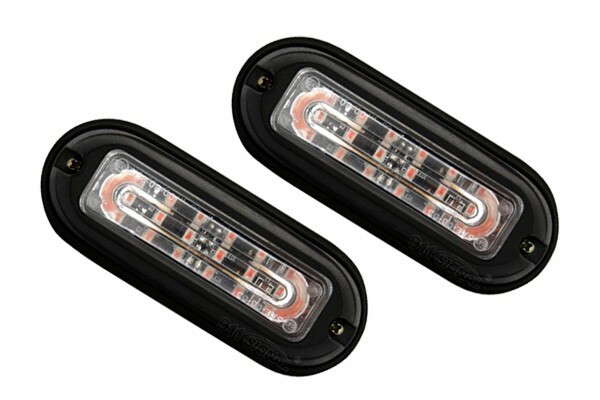 From the beginning, it was easy to recognize the superiority of LEDs over incandescent lights especially in automotive lighting, but the problems of controlling the light spread of a fuzzy light emitting diode also became immediately apparent. A single, stand-alone LED has an uncontrolled light spread of approximately 120°, but the light does not project very far. A focused lens was needed to concentrate the LED light. A faceted cone-like reflector was engineered to recapture the dispersed beams into a 40° spread and to refocus the light output at a greater distance in front of the lens. The TIR lens was different from old-fashioned reflectors used with incandescent lights where much of the light strayed wide of the targeted area (image 2); almost all of the light from the LED comes into direct contact with this new TIR reflector to guide virtually all of its radiation toward the target. For this reason, TIR lenses ‘control’ the light. 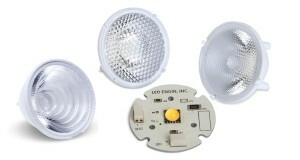 The modern LED emergency light was created when SAE requirements (a 40° horizontal spread) was finally met by engineers. The efficient TIR lens has a sharp cut off without the fuzzy edges that produce glare and dissimilation of light. It will collect, concentrate, and redirect the radiant energy of the LED. TIR lenses minimize glare and background light. Because it produces a symmetrical round beam distribution, it is perfect for an emergency light with multiple LEDs. The TIR lens provided a totally new application for the LED industry making it possible to create high intensity, rapid strobing, colorful emergency lights. Check out ETD’s selection of police car lights with TIR lenses. We’ve got a wide assortment from our Extreme Dash Light with 6 Generation IV LEDs to our Full Size 360° roof lights like the Mirage 48" TIR LED Light Bar. Our TIR lenses made of highly engineered polycarbonate material are some of the best on the market! While TIR lenses were a major breakthrough in the industry, there was a problem with them...reduced side visibility especially at city intersections. An oncoming motorist could easily see the bright TIR beam in the front or back of a stopped vehicle, but it was difficult to see a vehicle from either side because the TIR beam had a horizontal spread of only 40°. And while the highly focused beam was excellent on highways and roads because it could be seen over a long distance, it didn’t produce a wide enough light spread for city driving. To compensate for this limitation, the Linear Optic was designed. The Linear Lens produces a 60° spread , so there is more visible light fanning out from the center of the light and projecting to either side of a central point. This was a great improvement in lens construction especially when applied to bar lights and surface mount lights. A wider area is illuminated particularly when high watt LEDs are projected through linear optics making it a perfect choice for highway patrol cars. Any first-responder whether professional or volunteer knows that it’s crucial to be safe and seen when on the job, for so often there is not only the traffic incident to deal with but also approaching motorists. Linear lenses produce off-axis brightness so these lights are perfect for grille and dash lights because they disperse high-intensity light in a wide angle. The Linear Lens gives officers an illuminated margin of safety when they have to come to a stop or when they are rushing through intersections on a Code Blue. Our Chameleon 4 LIN Dual Color Traffic Advisor is one of our best selling products because the “4” has Linear 1 Optics that spread the LED light far and wide and are made of polycarbonate material that is tough and stay clear in all weather conditions. Even though Linear lenses created a wider light spread, they were not perfect. In 2013, an even wider lens was introduced; in fact, it provided the LED with the widest light span yet seen...with 180° . Now there was a light on the market that produced a full semicircle of lighted area from side to side. It provided maximum visibility especially through intersections and along city streets and alley ways. There are, however, still many light bars on the market which are outfitted with alley lights for lateral illumination. Our C-4 Series offers our customers a variety of 180° Reflex Lens emergency light setups to choose from. Increase the visibility of your first-responder vehicle by installing one of these products each with far-reaching Generation IV 3-Watt LEDs for maximum light output! Why has Polycarbonate Made Such a Difference in Police Car Lights? Polycarbonate enhances performance because it can produce excellent light uniformity that is transmitted at maximum and efficient light levels not only in police lights, but in all light applications. It’s an amazing substance that has tremendous capabilities. Now designers can literally ‘shape the light’ because of the plasticity of this material. Shatterproof lenses, housings, and coverings are made of it. When compared to glass and acrylic, it is superior in impact performance, density, and design flexibility, while equal to glass in transparency. No other manufactured product available today supersedes the optical performance, mechanical properties, safety, and design flexibility of polycarbonate; that’s why just about every Emergency Light Product that Extreme Tactical Dynamics sells is made of this remarkable material. Lenses have been used to manipulate and bend light for over 4000 years since the Assyrians used a glass disk to magnify things and to concentrate sunlight to start fires. “LENS” comes from the Latin for lentil because lenses had 2 converse sides similar to the legume. Today there are numerous ingenious shapes of lenses and optical devices with wide applications in industry, our work places, and in our homes. With our high-tech products ever evolving, who knows what the next lens will do..perhaps it will be designed to shine light around corners. We know lenses already beam light into deep space.